Time for a road closure update as Archer River has been over the causeway for a while. Also Bloomfield Road will not be sealed despite the rumours; and the third news - if you have the Destination Guide and noticed broken links in the past few weeks, those have all been fixed now. First, the arrival of the proper Wet Season has slowed down since the last newsletter, with a very unusually hot month - the kind of heat that reminds me of Darwin, been keeping air conditioners flat out. Most days still sunny, the early Wet Season type of days with some spectacular thunderstorms - not the all-day-grey-sky monsoonal rains that by now we had had for a month last year (actually, just as I write we have had a couple of cooler and windier days so it looks like it could be a welcoming change). Despite that, we have been trying to do some tracks and been reminded, that it doesn't have to be raining right here for the watercourses to fill - they are fed by the rains up in the mountains. Feral horses cooling down in a flooded creek crossing. No drive-through here! So, many of our favourite local tracks are cut off, and further north - Archer River has been flooding for a while. The main road is closed at Archer, and all the travellers should definitely consider the peninsula closed until the end of the Wet season. 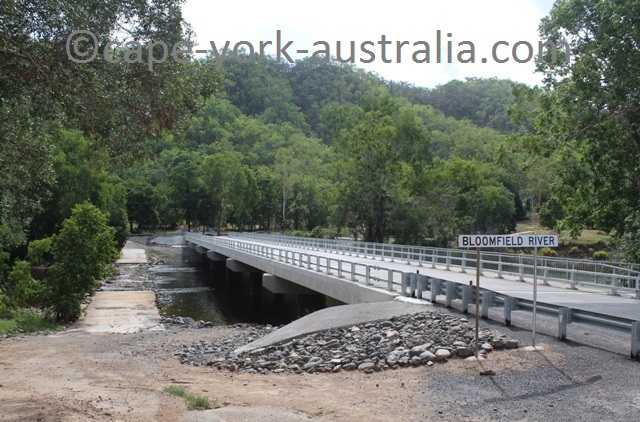 With the Bloomfield River Bridge finalised in August last year, and the second, Woobooda Bridge also a couple of months later, rumours were around amongst the locals about the sealing of the Bloomfield Road. The rumour went that if they spent the money to build those two bridges, surely it's because they want to seal the road. The truth is that those two crossings were bad enough before the bridges, which now give the locals more safety (I know the crossings are sadly missed by adventurers!). The new bridge, and the old causeway that was still the only way a year ago. The Douglas Shire Council (yep south of Wujal Wujal it's not Cook's) has said that some bits and pieces of the Bloomfield Road are getting sealed shortly, but that there are no short or long term plans to seal the road completely. 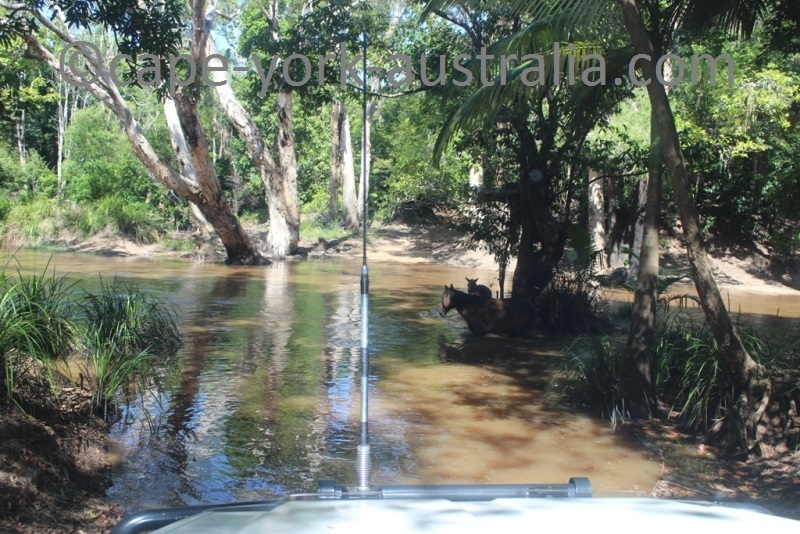 While it is not one of our slow four wheel drive tracks, it is still one of Cape York's fun gravel drives. And finally - if you have the Destination Guide, you may have noticed a fair few broken links lately. That was because a fair amount of pages on the website got changed during the past few weeks. That is all fixed now - and your printed version has not changed, only some links in the screen version. If you bought it during 2014-15, you have just been sent the corrected version, so it won't 'cost' you another one of your five downloads (it was sent to the email address that was connected to your PayPal account at the time of the purchase, and yes I am getting a couple of failure messages as well). If you did not receive it just give me an email and I will help you (wait a couple of hours please, as emails can take time to arrive, and if many people are asking, you may not get it quicker than that from me). If you have an older purchase you were not sent one because you have most likely done your trip, if you still do want this update, just give me an email.